Shown during the May 21 meeting of the Union County Board of Supervisors are Board President Steve Watson, board attorney Chandler Rogers, county administrator Terry Johnson and Dave Kitchens, supervisor for District Three. 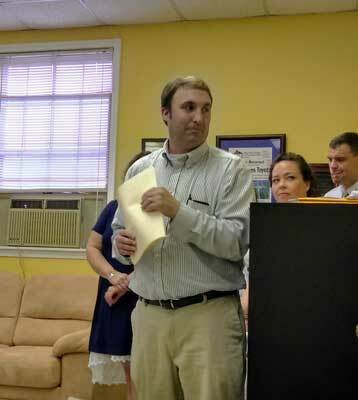 At the Union Co. Supervisors’ 5-21-18 meeting, the board awarded a scholarship, heard an appeal from a non-profit organization and approved travel for nine county officials to a convention. Board of Supervisors President, Steve Watson, awarded a $500 MAS college scholarship to London Erby, a 2018 graduate of New Albany High School. The Mississippi Association of Supervisors (MAS) awards up to two scholarships a year from each of the state’s 82 counties to family members of non-elected county employees. Applicants for MAS scholarships must have a 2.5 grade point average and declare their intent to attend an accredited college or university. London Erby said he would attend Mississippi State University. Robby Parman, director of the Regional Rehab Center in Tupelo, spoke to the county board during the Monday meeting. Robby Parman, director of the Regional Rehab Center (RRC) in Tupelo, spoke to the board about the work of the non-profit rehab center. Parman said RRC provides services without charge to persons needing services including audiology, speech therapy, occupational therapy, physical therapy, dyslexia and early intervention. The Union County Board of Supervisors appropriates $10,000 each year for the Regional Rehab Center. The board accepted a bid of $9,408 from G & O Supply for two culverts. One culvert is for County Road 121 and the other will be used on County Road 143. The board approved travel for a total of nine elected and non-elected officials to the Mississippi Association of Supervisors Summer Convention, June 11 – 14, in Biloxi. Travel was approved for each of the five supervisors, the county road manager, the county administrator, the board attorney and the purchasing clerk. The county board also conducted routine business including: payment of $2,500 to the Three Rivers Planning and Development District for grant administration and adding 9.17 miles of county roads for slurry sealing during the coming months.